RENDERING shows the modern design of large windows, many balconies. A modern-looking apartment building is in the works to replace nine bungalows on the 500 block of N. Wilton Pl. Developer Frost/Chaddock seeks to build 88 apartments in four wings after demolishing the 1920s homes that line the western side of the block, between Clinton St. and Maplewood Ave. The new building’s “four residential wings” will be connected by bridges and covered walkways, and flanked by open green space and courtyards, said JakeLaJoie, director of acquisitions for Frost/Chaddock. Architect John G. Reed’s exterior design features floor-to-ceiling windows, large balconies, painted stucco and corrugated metal. 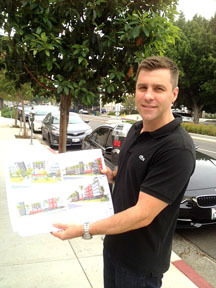 ON LARCHMONT Jake LaJoie shows the renderings. The property has three, 15-foot front yards—on Clinton, Wilton and Maplewood—creating “a huge park-like environment,” LaJoie added. In addition, Wilton has another 15 feet of dedicated space, (assessed by the city for future street widening). The top four of its five floors will house the apartments, with one and a third levels of partially subterranean parking for 142 cars and 88 bicycles. The two driveways are on Maplewood and Clinton. “This isn’t the worst development to come down the pike… It’s not exceptional. 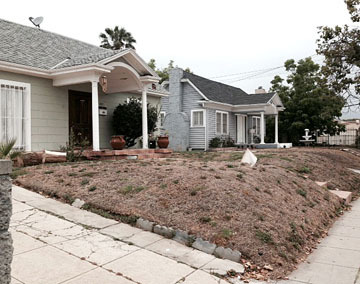 We would like it to be exceptional,” said Charles D’Atri, president of the Larchmont Village Neighborhood Association. While traffic mitigation and a setback on Wilton are the “two most important issues,” the modern design also does not sit well with the neighborhood, which, while not an historic preservation overlay zone, “we would like it to feel conceptual… and not something plopped in from Manhattan Beach,” D’Atri said. The developer has met with city Planning Dept. officials and the Greater Wilshire Neighborhood Council Land Use Committee. Rendering revisions are in the works and will be reviewed by community and city officials, LaJoie said. The developer began acquiring the properties in 2014 from between $650,000 and $1 million each and met with Council District Four last fall, whose representatives said parking, landscape and architecture would be key neighborhood concerns. BUNGALOWS wait to be demolished on the 500 block of Wilton Pl. The homes were originally built in the 1920s. The developer is renting the properties, and once demolished and the new complex is built, Frost/Chaddock will continue to manage. The full-service company also built Versailles in Koreatown and M Lofts in Palms. The Wilton area was up-zoned to R-3 in the 1980s and is surrounded by apartment buildings, including a four-story building just to the west of the proposed site. The 97,145 square foot Wilton project includes eight “very affordable” housing units, which permitted extra units under state and city law. “We really tried to do a reasonable project and put our best foot forward, and we’re hoping people will recognize that,” said LaJoie.